The island of Koh Mak is located in the East of the Gulf of Thailand, 35 kilometers from the mainland, at latitude 11 ° 49′ North, longitude 102 ° 29′ East. 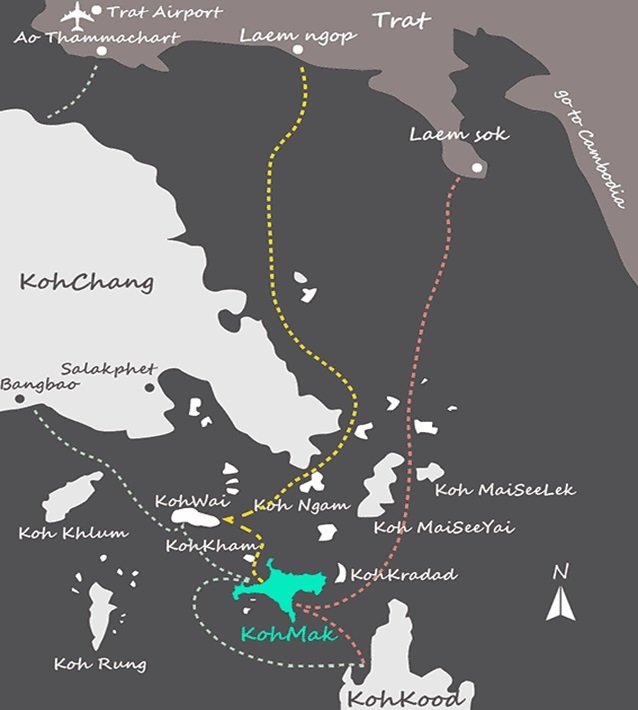 Koh Mak is the third biggest island in Trat province after Koh Chang and Koh Kood, with an area of 16 square kilometers. The island has a circumference of 27 kilometers, and white sandy beaches stretch from the north-west of the island round to the south. The traditional occupation in Koh Mak is coconuts and rubber plantation. Koh Mak is a relative new island destination and is still a well-kept secret for most travelers. The two main beaches lie on the northwest and southwest facing shores of the island. Koh Mak is a charming quiet place for people who are looking for a perfect hideaway. Even in high season, it is never crowded or busy. You will love Koh Mak if you love being close to nature. Q: What is it like staying with us? A: All bungalows are located along the beach. It’s easy access from room to the sea. You can enjoy the sunset right from the terrace. It is a perfect destination to relax and enjoy the beautiful sea beach scenery. Q: Do electric power on the island running 24 hours? A: Yes, but remind that island energy is limited, please kindly SAVE island energy for sustainable Koh Mak. Q: Are there any telephones or Internet WIFI spots? A: There is no landline telephone in the resort but cell phones are working fine in most areas. Internet WIFI is available in public areas. Q: Are there any medical facilities on site? A: For basic ailments, you can ask for medicine from our reception. For more serious ailments, we can send you to a small health center on the island or Bangkok Hospital in Trat. Q: Are there any souvenir shops and minimarts? A: Yes, there are souvenir shops and minimarts where you can buy most daily items you may need. But there is no 7-eleven (24-hour convenient store) on the island. Q: Any night life on Koh Mak? Q: How can we explore the island? A: There are motorbike, bicycle and golf car rental shops. A public taxi is also available from 9.00 AM - 10 PM. Q: Are there any banks or ATM machines? A: There is no bank or ATM machine on the island. The nearest banks or ATM machines are on Koh Chang and Trat mainland. Please note that only some resorts, shops and restaurants accept credit cards. Q: Are there any poisonous animals on the island? A: There are some snakes and scorpions but none are thought to be venomous enough to seriously injure or kill a human. There are also spider and small lizard but none are poisonous. Q: How about Sand flies? A: Our resort conducts a weekly fumigation to reduce the number of pests and sandflies. You can also prevent yourself by spraying insect repellent (“OFF” brand is recommended.) or applying coconut oil on your skin.